Zinc wire with 99. 99% purity in various diameters upto 18 swg can be manufactured as per customer`s requirement. Zinc Wires are supplied in coils or spools of continuous lengths. The minimum mass of the coil 25 Kg, unless otherwise specified in the order. However, in case of spools, the minimum mass will be 10 Kg. 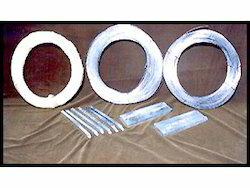 Zinc wire is supplied in coils of continuous lengths. The weight range of coil is from 25 to 30 Kg. Inner dia of coil is between 400-600 mm. Each coil is wrapped all round with Polythene sheet / gunny sheet to avoid scratches in transit and storage. The coils are marked with nett weight, Dia of wire and batch No. Sri Bhavani Metals Pvt Ltd., was established in the year 1977 under the dynamic leadership of Mr. J. Murali Krishna, a Mechanical Engineer with a vast experience of more than three decades in Manufacturing Sector. Sri Bhavani Metals is one of the largest Heavy Engineering, Heavy Machining & Heavy Fabrication divisions, equipped with imported machinery to handle heavy machining jobs for a variety of Industries including Cement, Sugar, Power, Mining, Turbines & General Engineering. We feel that the company`s strong brand, large size plants, integrated facilities, operational economies, vast network, skilled manpower, market-oriented product range and strict adherence to quality standards are its ticket to more competitive business world. We manufacture goods that mainly comprise Lead Alloys, Zinc Wire, Zinc Anodes. All these products are in high demand in the domestic market. Sri Bhavani Metals Pvt., Ltd. is dedicated to providing the greatest value to our customers through the highest level of service and quality. We work hard every day to meet & exceed customer's requirement. In Sri Bhavani Metals Declaration of Quality it says, ...variation is the enemy. .. Employees are responsible to seek out, reduce and control variation in everything we do. This is a unified company commitment, from the production worker to senior management. We have three full fledged manufacturing plants situated close to each other in, Industrial Development Area, Phase III, Jeedimetla at Hyderabad (India). The Production facilities are equipped with sophisticated machines and the latest technology. Our Corporate office is also at Jeedimetla. Our additional capabilities include infrastructure ( land ) in various high growth industrial sectors in Andhra Pradesh. Heavy Engineering, Heavy Machining & Heavy Fabrication division. Our machine shop is equipeed with Vertical Turret Lathes, Horizontal Boring Mills, Plano Millers, Large Radial Drills. We are vendors for some of the largest power industries in India. We manufacture Zinc Wire, Zinc Anodes, Zinc Sticks mainly used in Gas Cylinder and Capacitor manufacturing units. We manufacture Rosin Core Solder Wire, Lead Free Solder, Solder Sticks, Alloys of Tin, Lead Alloys, Lead, Silver, Antimony. Flux Cored Solder Wire/ Solder Sticks serve as critical inputs for a wide range of application in a wide spectrum of industries. Our personnel are our key strength. We have about hundred skilled workers and technicians. They are result oriented and highly motivated to give their best performance. Our team of well-qualified management personnel and staff are available round the clock to serve the customer up to his satisfaction.